Our camp at Ol'Kinyei was similar to Selenkay with a few differences. One thing I really enjoyed at Ol' Kinyei, was there was a larger "relaxation" area. There were a few hammocks, as well as several adirondack chairs set up; many areas to sit and either read, nap, or play cards during the heat of the day. After settling into camp it was time for lunch. We were served fish, salad, spicy vegetables, and a citrus flan with honey for desert. 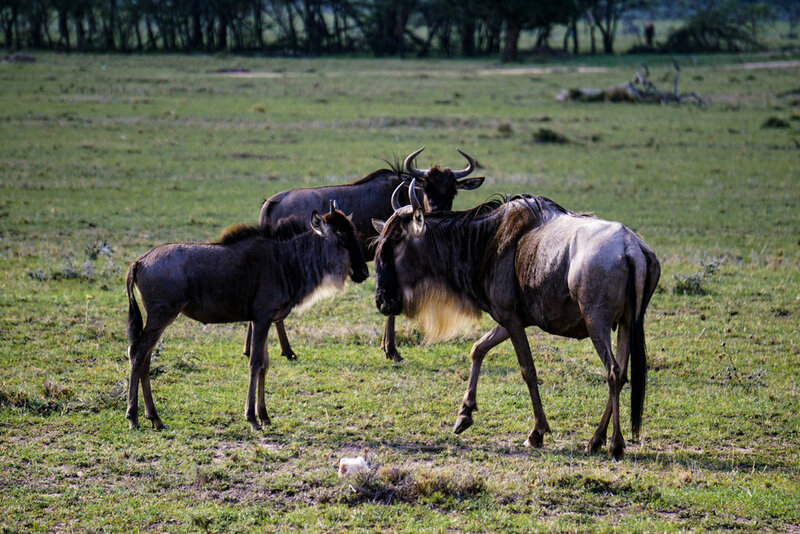 You do not go hungry on safari! We spent our afternoon relaxing and reflecting on the trip thus far and before we knew it it was time for the evening game drive. 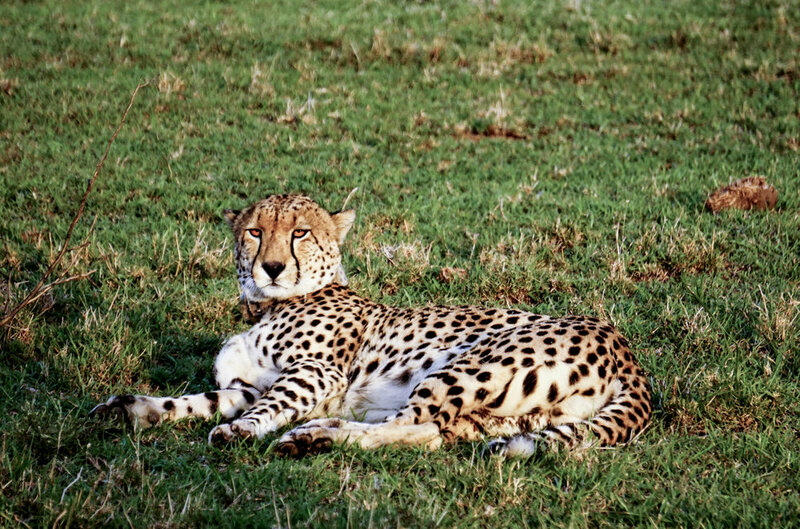 The highlight of our first drive in Ol'Kinyei was quickly coming across a cheetah that we watched (unsuccessfully) go after a herd of wildebeest. The subsequent stampede was just like a scene out of the Lion King. We stopped in a beautiful location for a sundowner, where we enjoyed wine and Tusker (local beer) while surrounded by herds of wildebeest. It was dark by the time we headed back to camp and we came across lionesses! Back at camp we had our bucket showers (which feel extra wonderful after a game drive) and enjoyed dinner by candlelight. On tonight's menu (at least for the vegetarians) was pumpkin soup, freshly baked bread, eggplant with other mixed veggies and potatoes in a spicy red sauce. Our first night at Ol'Kinyei was the last night for a few of the couples/families we met our first night back in Selenkay. It was so much fun to catch up with them and hear about how their time had been since we last saw them. One of the couples was celebrating a wedding anniversary, and the entire staff surprised us all by coming out after dinner and performing a beautiful traditional dance and song. They baked an anniversary cake that we all shared! Even though each day follows essentially the same format, somehow they all ended up being unique and magical. July is winter in Kenya, and that night was our coldest yet! Even as warm blooded as I tend to be, I still slept in sweats, a long sleeve shirt, a sweater, and a jacket in my sleeping bag with a heavy blanket on top! Wake up call that morning was 5:45am. After a quick cup of coffee we were off in search of lions. We ended up coming across an elephant who had died from natural causes- our guides called Kenyan Wildlife Services who came to remove the tusks. This morning we were treated to a "bush breakfast" and met up with other guests from camp for a large breakfast together. The chef had packed picnic baskets of hard boiled eggs, toast, fruit, bacon, cereal, and coffee and tea. On our way back we passed a family of elephants. We relaxed at camp lounging in the hammocks until lunch. For lunch we had chicken, grilled veggies, french fries, marinated cucumbers, AND a cheese plate! 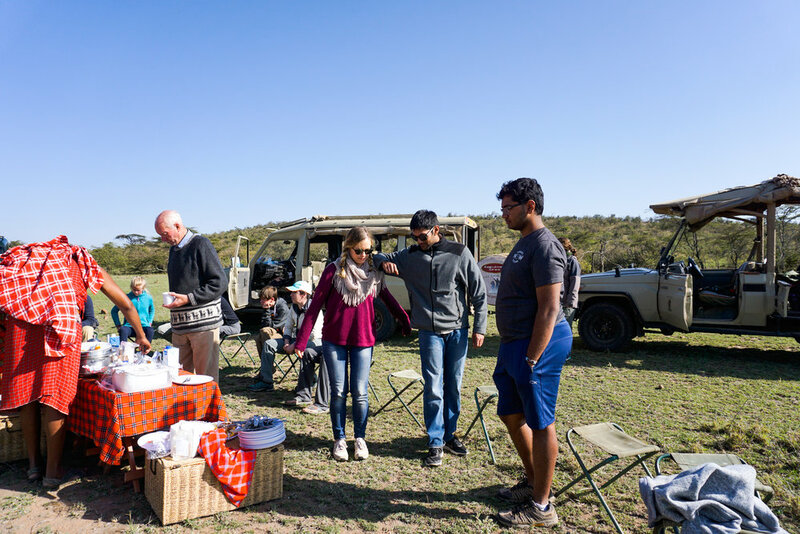 I was in heaven - I love a good cheese plate and was surprised to be served one in the middle of safari. Desert was a passion fruit sorbet. Over lunch we met a Chinese man with a passion for lions and conversation. He previously quit his public sector job in China and moved to Africa to work in lion conservation with a goal to minimize lion-human conflict. He has lived thus far in 13 African countries and currently was working in Kenya! Like past days, we enjoyed our afternoon before heading out for the evening game drive. One of the real pleasures of the "adventure camps" was the lack of WiFi. It was wonderful to disconnect from our phones, social media, the internet in general and spend our time talking, reading, or just napping. One realization I made is I need more travel (or time in general) spent like this! On our afternoon drive we came across two male lions- after spending some time around the lions, we had a quick sundowner and headed back to camp for bucket showers and dinner. Tonight was celery soup again (my favorite! ), vegetable ratatouille, mashed potatoes, mixed veggies, and a chocolate brownie. We heard some fascinating stories from a fellow guest from the UK who grew up during WWII. That night we also met some members from the Kenyan Tourism Board as they were filming an international commercial the next day and staying at our camp site for the night. Meeting people from all over the world was half the fun of being on safari! A few of us opted to go out on a short night drive after dinner; we didn't see too much - some rabbits, bush babies, African kangaroos, and a few foxes. We came back and for once went straight to bed- we were wiped! No fireside chats this evening. It was another chilly night- the Mara was MUCH colder than in Selenkay. Every night in camp I would wake up in the morning and be asked, "Did you hear the 'fill in the blank'" last night and I never did. I consistently had the best sleep of my life while on safari. This particular night however I woke up around 1 am to bush babies screeching. Later that morning the camp staff said there were a few lions roaming around near camp around 4 am but I didn't hear any of that. We left that morning at 6 am to begin our 2 hour drive to the Maasai Mara. 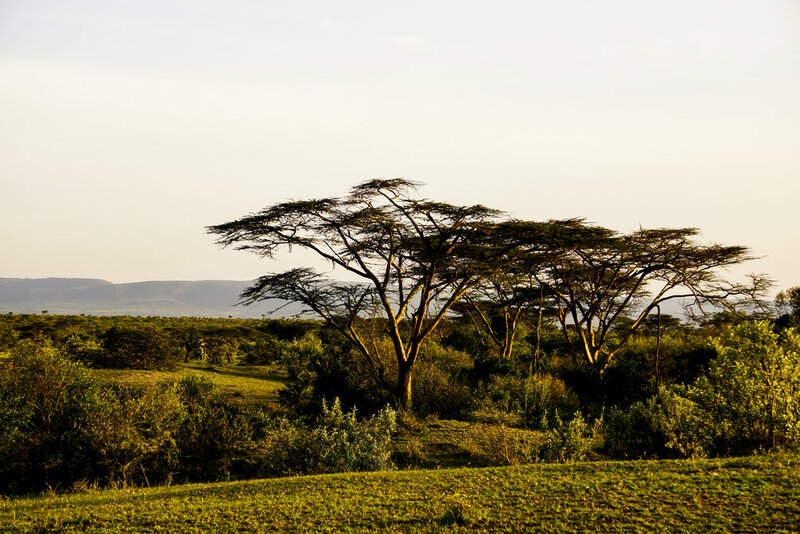 The Maasai Mara essentially felt as though we were transported straight into the Lion King and deserves a post of it's on! Stay tuned.